So 8 million are to be exterminated because of their ethnicity. As the conversation goes, Shufrych agrees with this «final option» for finding a solution to the issue of Russians living in Ukraine. It’s impossible to take it as a botched joke; today Mrs. Timoshenko is a gray eminence who calls the shots from behind the scenes. The so-called acting president Turchinov is a puppet on a string who has been dancing to the Timoshenko’s tune for the recent 15 years. Turchinov is kind of a devoted slave daring no move without the consent of his mistress. Batkivshchyna (the All-Ukrainian Union «Fatherland»), the Timoshenko’s political party, holds the reins in Ukraine today. Yatsenyuk, the so called prime minister, is a Batkivshchyna member closely connected to Timoshenko. In some mysterious way she managed to leave the wheel-chair right upon her release from jail. Standing on her feet now, she is the person who really holds the power in the country. Timoshenko has Right Sector (Pravy Sector), Svoboda (Freedom) and Maidan self-defense groups – armed fascists free to march under the slogan «Ukraine for Ukrainians!» – on a loose leash. And now all these people will not wink an eye trying to assure that Russians have nothing to be afraid of in Ukraine, and nobody will ever dare to encroach on their rights. 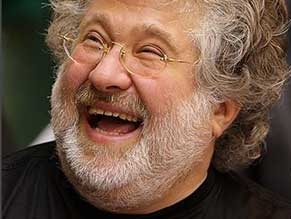 One of the principle sponsors of Euromaidan, Ukrainian oligarch Ihor Kolomoisky. Today a lot of things have come to surface providing a clue to what the Kiev junta wanted to do with the Russians of Crimea after the coup was staged. They planned mass slaughter of all public figures. Russia saved the Crimeans at the last moment by literally pulling the peninsula out to escape the hand raised to stab it with a knife. The real intentions of Kolomoisky towards Russian population are becoming clear. Kolomoisky, Governor of Dnepropetrovsk region, is a Timoshenko’s countryman; they have close business ties and think alike when it comes to Russians. His deputy Boris Filatov left a post in Facebook calling for making lucrative promises to Russians at first to hang them all afterwards. This high placed scum is not alone in his plans as the conversation between Timoshenko and Shufrych shows. The threats of physical violence against political opponents and anyone who thinks differently brings to memory the events that took place in Germany in 1939-1941. That’s what makes so eerie the everyday life of contemporary Ukraine democratized by Americans. It would be interesting to see how «free world leaders» will react to the Timoshenko’s recent revelations. As is known they spare no effort to display their ardent support for «young Ukrainian democracy». It would be right to make them comment the conversation. Western leaders should either recognize that they have made come to power arrant knaves, who are dyed-in-the-wool fascists with criminal minds and behavior. In this case they should abstain from hindering Russia’s activities aimed at protecting compatriots abroad. They can also sort out the mess themselves bringing their puppets to order and getting rapists and terrorists out of power structures. If the West does not recognize that its Ukraine’s policy has been wrong and refuses to rectify the blunders, then others will. In this case the world will have to support those who stand in the way of fascist plague being spread across the country with 45-million population at the time Ukraine marks the 70-year anniversary of liberation from fascist’s occupation.